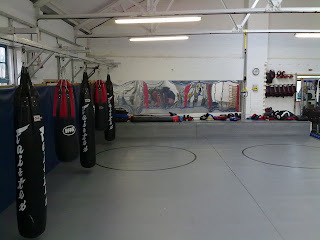 I stopped off at the Pro-am fight centre this week: they have an extensive gym as well as a full size cage and mat area with plenty of hanging full size and half size bags. 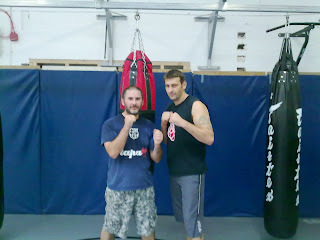 These guys train in MMA (Mixed Martial Arts) in Cambridge and even have professionals who drop in to train for fights. I was roped into a boxing class, which was entirely new to me. I have done some savate in the past but really nothing to talk about so I was intrigued by a boxing lesson. The teacher was ABA affiliated and extremely good: polite but worked us hard. There was some very different levels here (including me, relative beginner) and he catered for us all and by the end of the hour (or was it 90 minutes?) I was sweating buckets... But I was happy and felt I'd learnt a lot (hands up, strike and move, maintain a distance, stay relaxed). Great class, I'll be looking at doing more! Maybe I'll try the Muay Thai class....!